Donna Hulbert, 47, of Mena was charged with DWI II. The arrest followed a call to an accident on a city street. Matthew Cannon, 38, of Mena was served an outstanding warrant from the Polk County sheriff’s office. Melissa Hartin, 42, of Mena was charged with third degree battery and resisting arrest after officers responded to a call at a local residence. Andy Ryan Sebren, 37, of Mena was charged with theft of property and public intoxication after a call from a Mena resident. 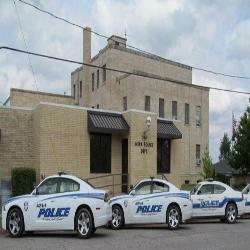 Report was made of a verbal altercation between two Mena residents. Neither wished to press charges. Rennee Rose Bruce, 32, of Wickes was arrested on an outstanding warrant for failure to pay fines and court costs. The warrant was from the Polk County sheriff’s office. Katie Danielle Flood, 20, of DeQueen was served an outstanding warrant from the Polk County sheriff’s office for failure to pay fines and court costs. Kimberlina Upton, 19, of Mena was arrested on a warrant from Scott County. A 17-year-old Mena youth was charged with assault on a family member and disorderly conduct following a call from a local citizen. Case has been referred to juvenile authorities. Kia Cottman, 32, of Mena was arrested on an outstanding warrant from Mena police department for failure to pay fines and court costs. Shannon Shaw, 38, of Mena was charged with theft by receiving. The arrest followed a call from a Mena resident. call from a local retail store. Audra Cogburn, 28, of Mena was charged with theft of property (shoplifting) following a call from a local retail store. She was also served five outstanding warrants. Jack Allen Curry, 38, of Hatfield was charged with driving on a suspended driver’s license. A local woman reported that she is being harassed by an acquaintance. Case is pending receipt of further information and location and interview of suspect. Report was made of a Mena man being harassed by a former employee. Case has been sent to the prosecutor’s office for possible issuance of a warrant. Report was made of harassment and threats being made to a local resident. Case is pending. A 13-year-old Mena boy was charged with curfew violation when he was reported missing and subsequently located after midnight. Case has been referred to juvenile authorities. Megan Casey, 20, of Hatfield, was charged with theft of property (shoplifting) after officers responded to a call at a local retail store. Kamara Dowdy, 25, of Mena was arrested on an outstanding warrant Mena police department for failure to pay fines and court costs. Benjamin Frost, 18, of Hatfield was charged with theft of property (shoplifting.) The arrest followed a call to a local retail store. Amber C. Lee, 22, of Mena was charged with theft of property (shoplifting) after a call from employees at a local retail store.